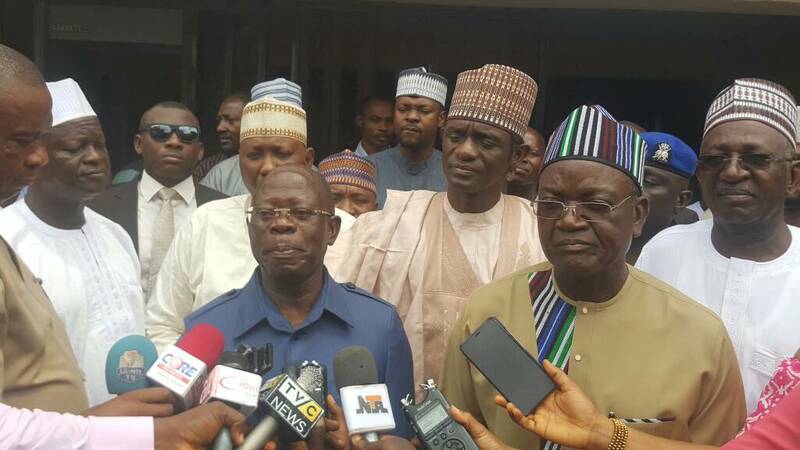 Governor Samuel Ortom of Benue state denied dumping All Progressives Congress (APC), Ortom who spoke with newsmen in Abuja after a closed door meeting Mr Adams Oshiomhole, the APC National Chairman. The governor and Sen. George Akume, a former governor of the state had been having a running battle over who controls the state party structure. “It was the Benue APC that gave me a red card not the national APC and that was enough to make myself available out of the pitch. “I am here in APC, I am a member of APC, I am still flying the flag of APC, I only said I was given red card but I have been corrected by the national secretariat,” he said. The Benue Governor appreciated the party’s leadership for intervening in the matter and expressed hope that it would be able to resolve the differences. Oshiomhole, while reacting to the development, said the APC does not have red cards in its cupboard and could not give what it doesn’t have. He noted that there could however, be legitimate legal issues and disagreements in some of the party’s state’s chapters. This, he said, was evidence of the fact that the APC was a free democratic party, adding that it was the responsibility of the its leadership to help aggrieved members to find a common ground. Oshiomhole added that the issues in the Benue chapter of the party were not too fundamental that it could not be resolved. He expressed confidence that the issues between Sen. Akume and Gov. Ortom would be resolve by the party’s national leadership. He maintained that Sen. Akume, was a very respected leader, of the party and would recognise the need for peace, adding that the APC leadership had what it would take to make peace. This, he said, would not be without contestation, but would be based on the understanding the party had the qualities required to resolve issues on a win-win manner even when contestations comes up. He assured that such tools would be deployed in Benue to make both Gov. Ortom, Sen. Akume and the people of the state not just APC members happy. He further assured that the APC leadership would do everything possible to help those who had issues to have those issues resolved. Oshiomhole stressed that the APC leadership would do everything possible to address crisis within its states chapters and ensure that its committed members remained in its fold.